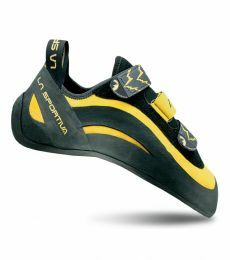 The La Sportiva Miura VS is the slightly stiffer version of the Miura Lace, as well as being better suited for wider feet. Unlike the original, the Miura VS features La Sportiva's P3® rand system that makes the shoe slightly stiffer and less likely to lose its shape after stretching. Aside from that, the shoe is mainly the same. It features a slingshot rand and a Powerhinged sole that, when small edges are weighted, prevents the shoe from stretching in the front half of the shoe to keep power and control on tiny holds. An aggressive downturn does mean it can still hook onto overhanging holds and slot into pockets, however! Many people wear these shoes tight for technical sport climbing and high-end bouldering, but others who have worn them looser say that they perform just as well for crack climbing, trad routes, and big wall climbing. They have a leather upper with a synthetic lining (none under the foot however so as to not reduce sensitivity), and so will probably stretch about half a size. Para mi el mejor pie de gato, ya que se puede utilizar tanto para grandes escaladas, boulder o deportiva. Este gato no deja indiferente a nadie. Se adapta perfectamente al pie y tiene muy buena precision, tanto en desplomes como en adherencia. Al principio está un poco duro y quizas duelen un poco los pies, pero despues va como un guante. el envio fue excepcional, a España solo tardo como 15dias en llegar y encima en perfectas condiciones. seguro vuelvo a comprar a traves de esta pagina. I bought the shoe more or less one month ago. Having read a lot for this shoe I was convinced that it is one of the best choice for climbing indoors and outdoors, Boulder and sport routes. And it didn't disappoint me. Indeed it is an all time great shoe . It's really stable and and I can step on edges that I couldn't imagine that it's possible. I compare it with my old saltic shoe and I understand why it is worth it to pay this amount of money to buy it. I climb 1.5 year so I definitely suggest it to someone that wants to feel an upgrade to their climbing performance. As for the size my normal shoe is 43-43.5 (EU) and I bought 41 but I think that I could have bought 40.5. Works fine for women too! I normally wear W's Miura (laces, white) in size 38,5 as my comfortable yet precise pair (read long slab trad routes) and wanted something as supportive and comfortable but slightly more aggressive. I got these in the same size and they fit the bill perfectly! And they don't loose their downturn shape. The W's VS version crushes my toes while still leaving to much space under the arch and around the heel (in 38,5 and also 38), hence the womens lace-ups. For reference my toes are medium width I would say, with narrow mid-foot and pretty high arch plus a big "knuckle" on the back/outside heel. Great shoe for boulder and sport climbing. Number 1 choice. The Miura VS and Miura Lace are two different shoes. While the lace is for crack climbing with different rubber and shape, the Miura VS is an edging machine! It´s stiff and downturned with hardish rubber. Painful at first, but once it´s streched it´s all good! For me the Lasportiva Solution is a better allrounder, but the Miura VS are better at edging. Miura VS doesn´t have much feel to it, being stiff with hard rubber, so it´s not that great at smearing. The heel is great for heelhooks, but the toes are poor for toe hooks (this can be solved by adding/gluing rubber a la 5.10 rubber shavings kit).And the toes are really down turned and crammed inside the toebox, so crack climbing jamming feet is out of the question in these for me. Same size as Solution, half a size up from Mirua Lace, a half/one size down from 5.10 Anasazi Lace for reference. I bought these for my boyfriend to try. I have been wearing the female version, exclusively, for the last 2 years. I have down sized but they do not cause pain, even when new (street size 37/38 - miuraVS size 35). The 3 strap closure means a perfect fit for every foot shape. I can wear them on routes straight out of the box - gone are my days of wearing new boots round the house to stretch them in. I use them indoors to train and outdoors for bouldering and sport climbing (all angles and rock types). They have never let me down and their stiffness has sometimes been a bit of an advantage. The also wear very well for a top end boot and last much longer than other brands I have used. My boyfriend is a convert and he ordered another pain after his first outing in them.